Michael Horowitz Gypsy Picking PDF + Mp3 CD download. Play faster, louder, and with better tone by learning the rest-stroke picking technique used by Django Reinhardt, Stochelo Rosenberg, Bireli Lagrene, and Fapy Lafertin. In this book you’ll learn: Proper body and hand positions; The Rest-stroke picking technique; Fifteen picking patterns; Thirty of the most commonly used phrases; A minor blues solo packed with Django’s favorite ideas; History of Django Reinhardt and other Gypsy guitarists. The book is organized into four sections. Part I, “Gypsy Jazz,” provides historical information about Gypsy jazz and the Rest-stroke picking technique employed by Gypsy guitarists. Part II, “Fundamentals,” explains proper body positions and practice guidelines that will help you progress more rapidly. Part III, “Picking Patterns,” provides detailed explanations of the basic techniques required to execute Rest-strokes. 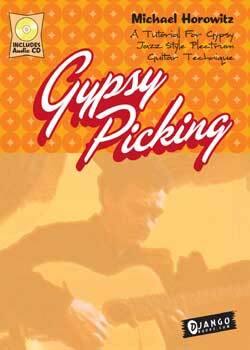 It includes fifteen picking patterns that are the cornerstone of Gypsy jazz style playing. Part IV, “Musical Examples,” contains thirty examples transcribed directly from the playing of Gypsy jazz guitarists. These examples are organized by their corresponding Picking Pattern from Part III. To help put some of these examples in context, a four-chorus long minor blues solo is provided for additional study. The accompanying CD has audio examples of the fifteen picking patterns, thirty musical examples, and the minor blues solo. Download Michael Horowitz – Gypsy Picking PDF free and other books from our site. Only high quality PDF scans. Please write a review, it's important for our community.